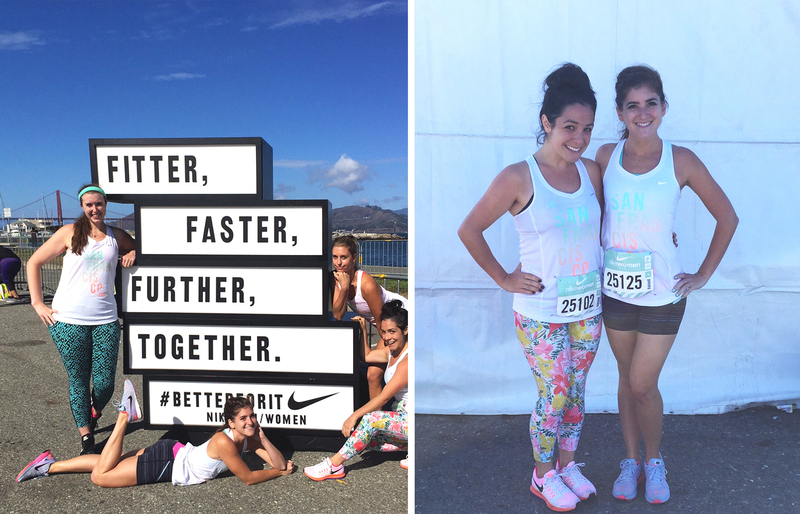 Coming back from SF with the best runner’s high (ok kind of a cringe-worthy statement but it’s true). Honestly, I’m starting to feel like a semi-competent athlete and not entirely physically inept. 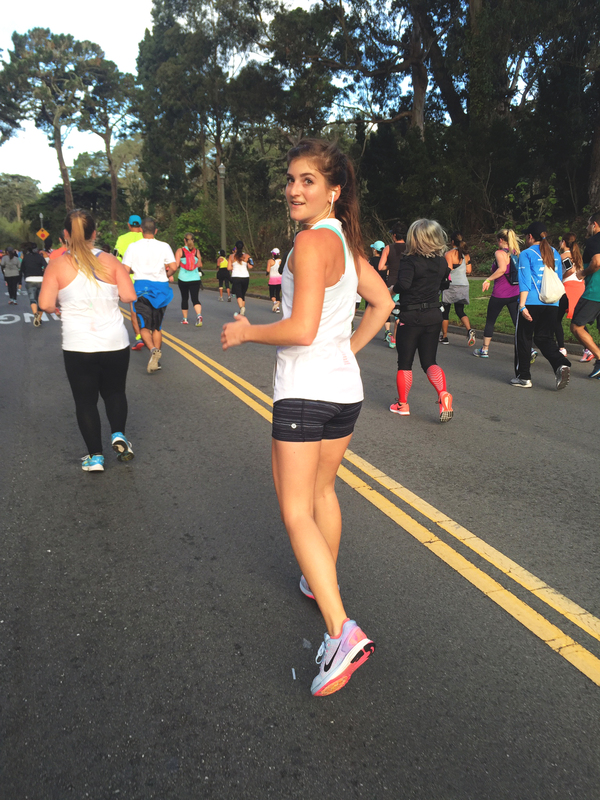 Last we chatted, I was about to embark upon my third half marathon, which would be my second time in SF for the Nike Women’s event. It truly is one of my favorite weekends of the year; there’s so much energy, positivity and encouragement. That, plus I just love being in San Francisco. I’m sure you can tell already how much I love that city. I hope it likes me back. 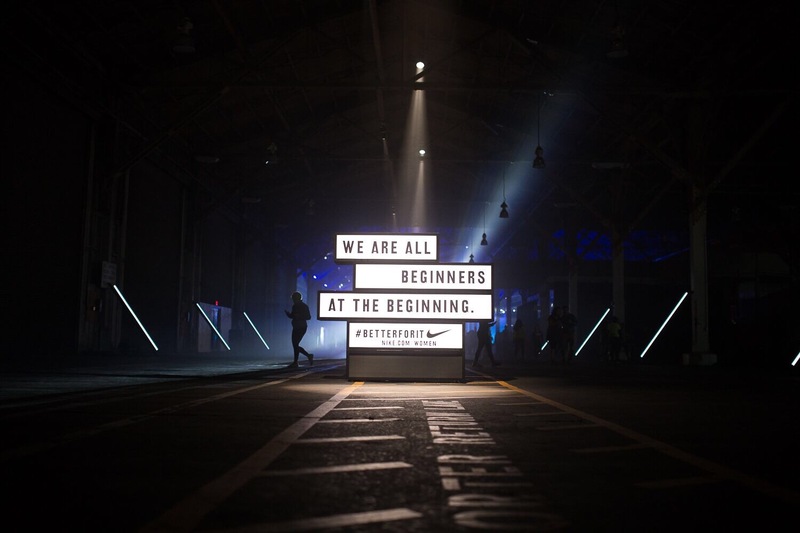 We got into the city early, so we could go to the NTC “Get Focused” training club. They hosted it Friday night at Pier 35 in the Embarcadero, which was super cool, and there were a ton of free goodies (namely, Urban Remedy juices and chocolate truffles from Whole Foods). 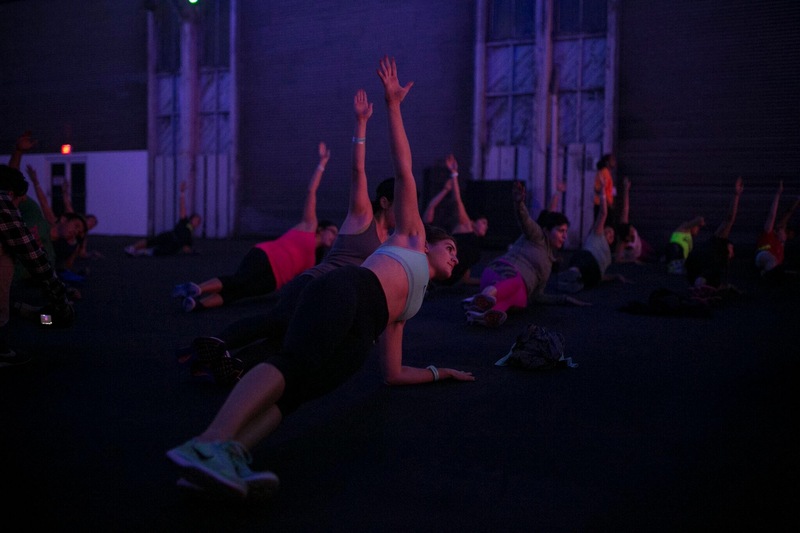 We did some strength training and core work with Marie Purvis and other Nike Master Trainers. Super fun, even when we looked ridiculous. 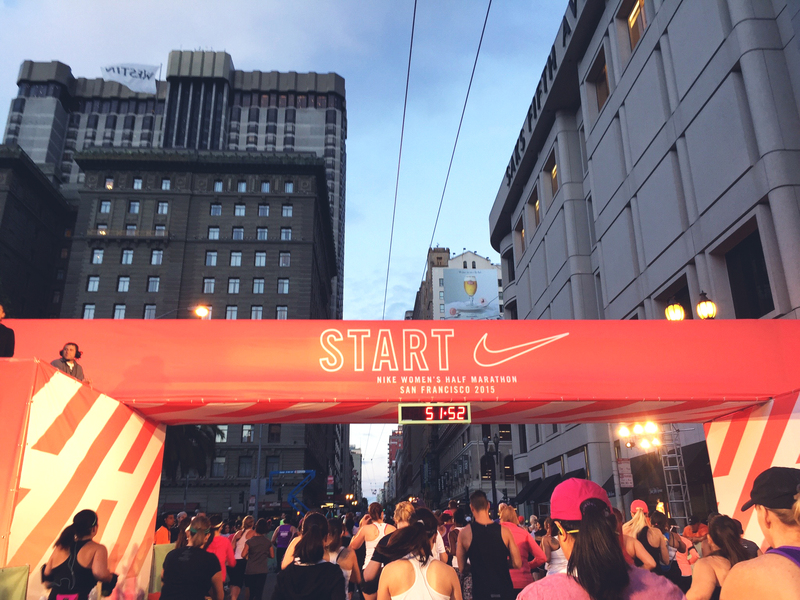 The next morning (Saturday), we went for the morning “Shakeout Run” with Nike Run Club. We ran a little over 2 miles through downtown SF, and I unintentionally clocked my fastest mile and 1k in one fell swoop. That’s the adrenaline for ya. It was supposed to be an “easy run” but I was just so excited. After a night of carb-loading and gnocchi, we woke up early – 4am ish. I washed my face, brushed my teeth, braided my hair (just a simple french braid on the side, into a ponytail), put on a little mascara and liquid liner on the top lids (there were pictures being taken and I didn’t want to look like a turd), got dressed and rolled out my muscles a little bit with my foam roller. Then came food. And vitamins (I took a B12 tablet). The sole lululemon product pictured: what the sport shorts. I can’t tell you how clutch these were. Stayed in place the entire time. I’m not a model as you’ve seen from basically every photo on this blog, and my thighs touch, which makes most shorts ride up little by little. 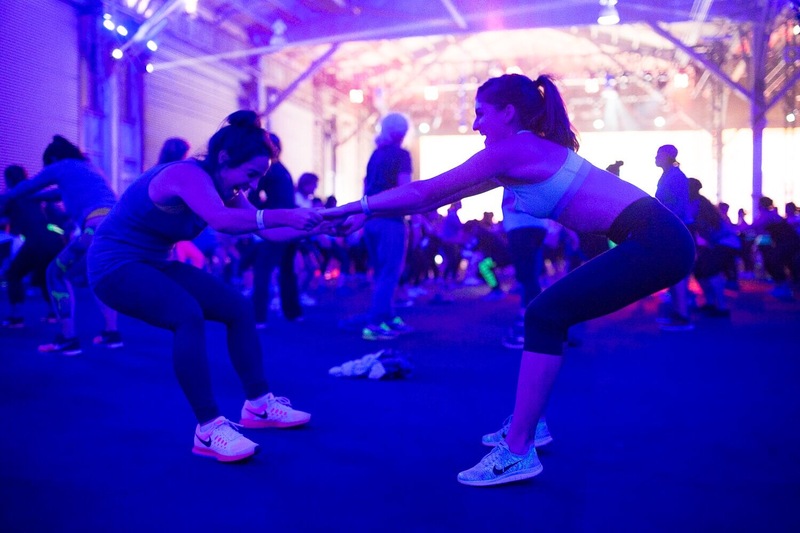 Whatever magic engineering lululemon did on these shorts… it so much more than worked. So happy I got these. The sole lululemon product not pictured BUT SUPER IMPORTANT: light as air underwear. I don’t want to be weird, but stop what you’re doing and GET. THIS. UNDERWEAR. It is magic, it is amazing, it is so smooth and comfortable. GO. GO GET IT. I’m seeing bad reviews on their site in terms of washing/falling apart – I have not had this issue, and I’ve owned several of these for months now. I have hand washed and machine washed, line dried and machine dried. They’re great. Idk what the deal is with those other people. 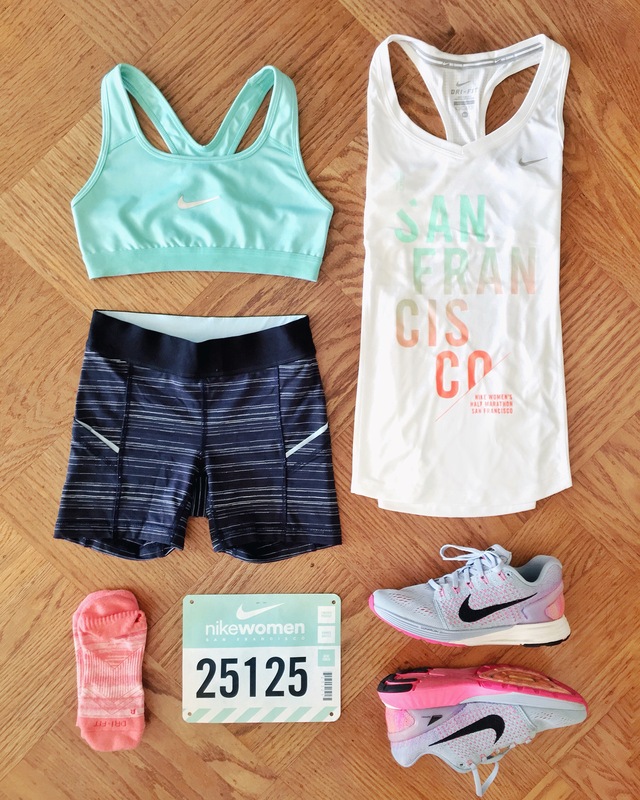 The rest is Nike: Nike Pro sports bra, Lunarglide 7, Dri-FIT cushion tab socks (similar here), and a race day tank. Checked with all the real athletes I know who play sports and are good at them, and the general consensus was exactly what I’ve been eating (yay! ): whole/multigrain toast + pb + honey, a banana, and a hard boiled egg (I’m obsessed with this bread from Alpine Valley, you can get it at Costco or Whole Foods). I also had an Arbonne Phytosport (powder mixed into a water bottle) for the added electrolyte and energy boost. Feeling v good about these decisions. Before leaving, we grabbed our belts/waist packs (just found these cool ones from SPI), phones and headphones, and sweatshirts we planned on donating (you take them off between Mile 1 and Mile 3 once you get hot, and they’re donated to the homeless in the area). 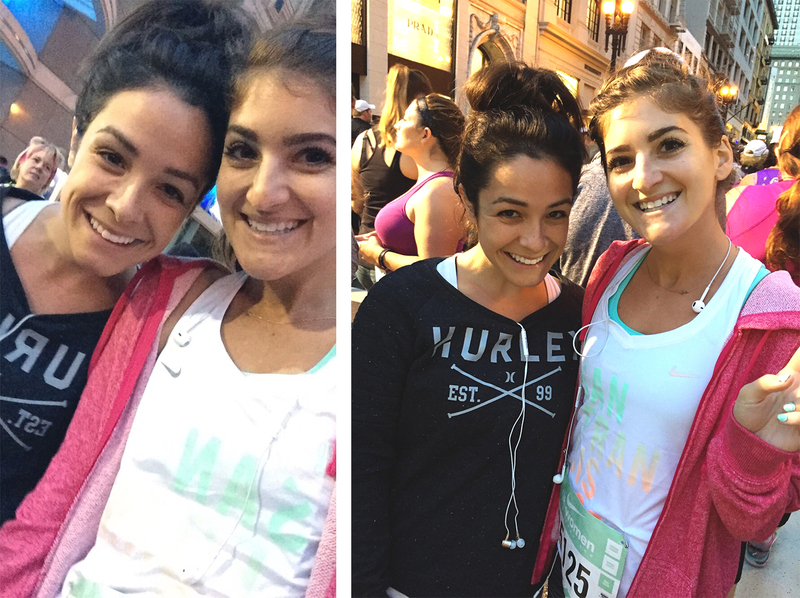 We drove to the finish line so we’d have our car at the end, parked, and took a lyft to the start line. Because we are not real runners/in the slow wave (11:00+ pace), our start wasn’t until nearly an hour after the official start time. We planned this into our travel time. 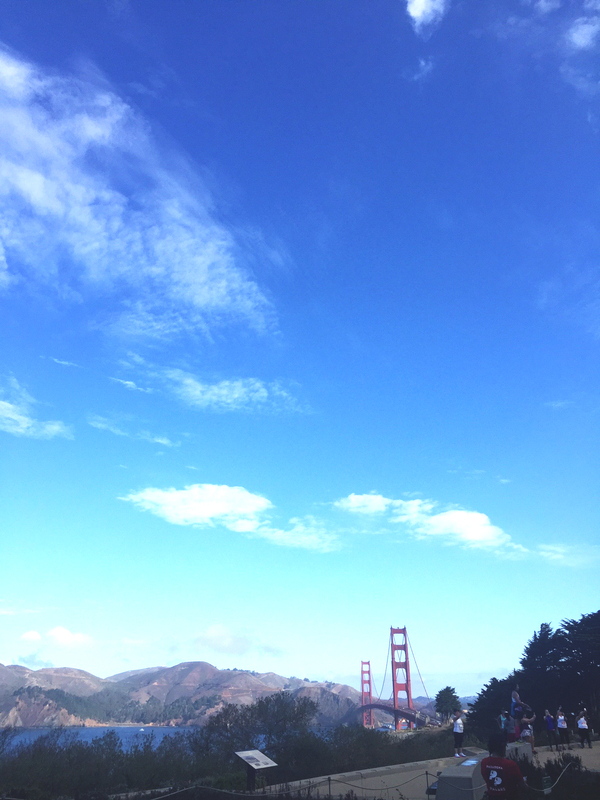 Same course as last year, but I got to see it with new eyes: this year I was in better shape, the weather was a little brighter, and the clearing of the fog allowed for full views of the Golden Gate Bridge at the top of the hill at Mile 10. It’s seriously so stunning, every mile of it. It almost distracts you from the fact that your toes feel like they’re all broken and you might have shin splints and your lungs are pretty mad at u. 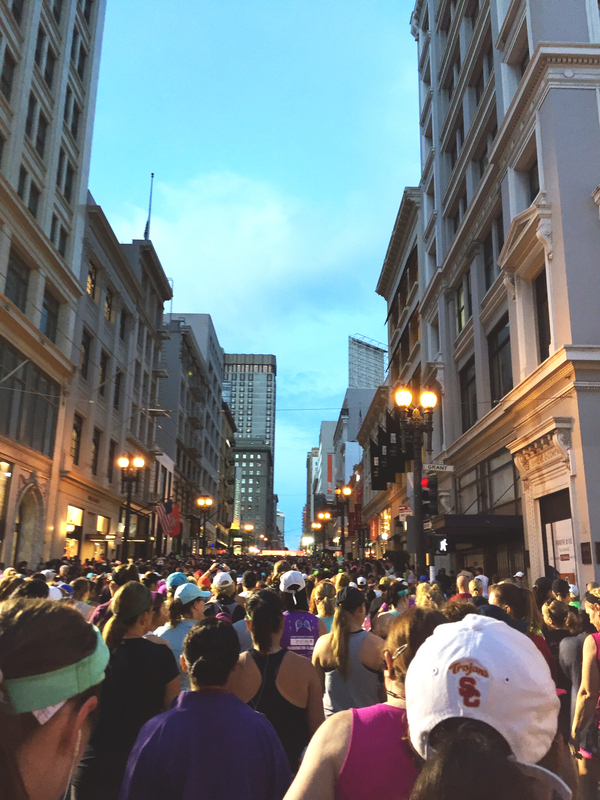 This year I also listened to music more, with both headphones in – I think that helped with my pace. It kept me more focused, whereas last year I was talking quite a bit and music was kind of on in the background. Maybe that was more of a distraction? 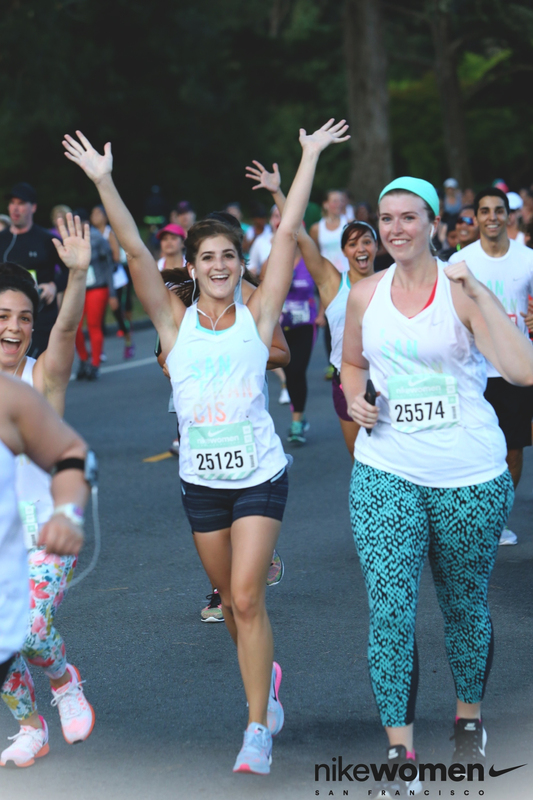 I honed in on songs a little more this year, and figured out which songs made me feel pumped up specifically while running, versus driving in the car or “at da club with the girlz.” You know what I mean? There’s a time and a place for everything. This time and place was voluntarily running an extended distance very early in the morning on steep hills. So anyway. I was feeling really good about my song selection. Have you ever felt like a song literally carried you up a hill? 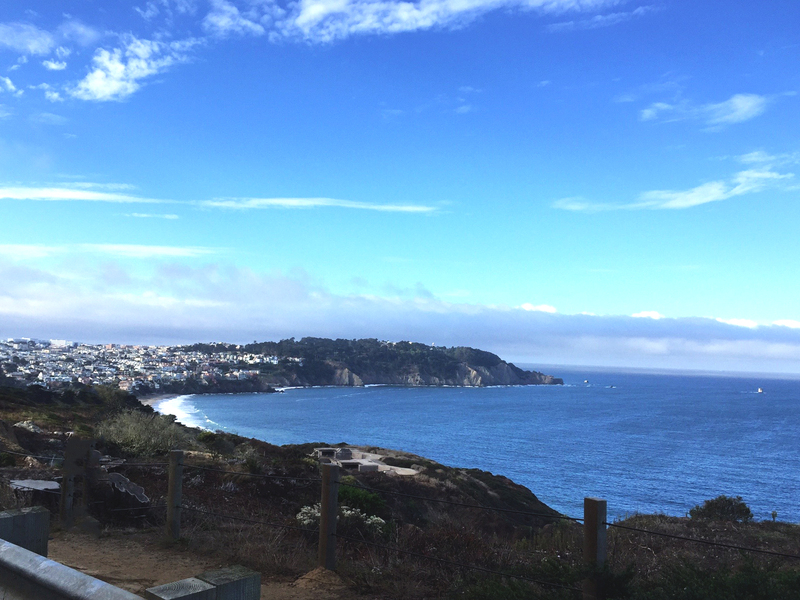 There was a moment between mile two and three where we hit a steeper, harder incline, and I thought, “Oh, Flume, thank GOD you’re here, we’ve been waiting” (we, as in me, my lungs, and my feet, and my subconscious). This song here was a lifesaver on those hills. But my FAAAVORITE running jam that seriously gives me a bigger adrenaline boost than I imagine any drug could: Indian Summer by Jai Wolf. I don’t know why, but it just makes me feel so powerful. Do me a favor: go for a run and play this song and let me know how it goes for you. Also a last minute add was that new Calvin Harris x Haim song, super clutch. s/o to my girl Cheyenne for playing that in the uber the night prior. The first few miles breezed by. I kept a slow pace, because I didn’t want to exhaust myself early on, but I was still going faster than I was last year. I was feeling good. 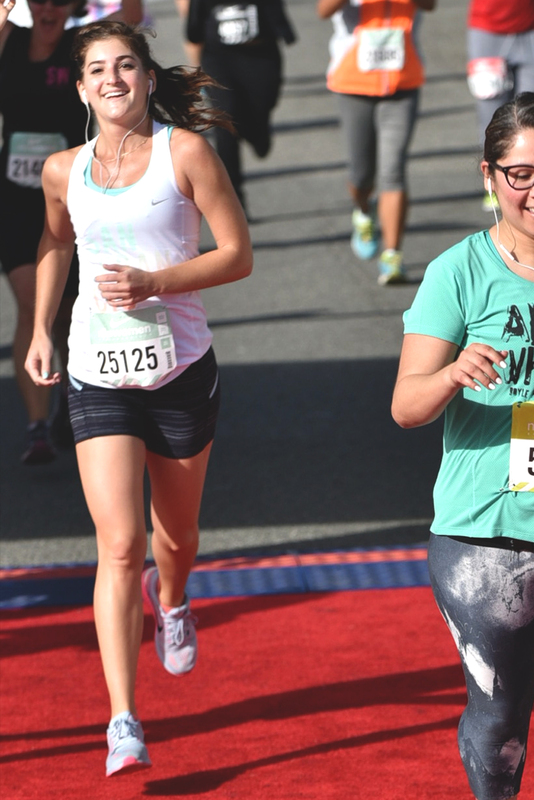 I don’t know if it was the music, the cross training I did prior, the adrenaline, the weather, the heavens, an act of congress, or what: I didn’t stop running. Even the pictures I took (you can tell they’re kind of shaky)… I was running while taking them. The more miles that went by without stops, the more surprised I became. It was like there were two of me – like I was observing my physical self during an out of body experience, thinking “wtf is happening” while watching physical me behave abnormally. “Where is this coming from? What is she doing? Why isn’t she stopping?” Super bizarre, right? And to think, zero marijuana was involved in this. I just kept surprising myself, mile after mile. Side note: I was extremely concerned when there were no orange slices in the park. Like, beyond concerned. The thought of getting orange slices is what had kept me going. Fortunately, a sweet angel from heaven aka a random man who apparently owns an orange grove appeared somewhere around Mile 9 and nourished us with the precious nectar of the gods. We were feeling spectacular. I think I must’ve been smiling the entire time. Or most of it. Just think about that for a second. I was just smiling and running and sweating, like a psycho. What is wrong with me. The rest of the course was downhill/flat. At this point, I couldn’t believe how much I had been running, and I was on a pretty good high. We coasted into the Marina and mentally prepared for treats and Tiffany’s. 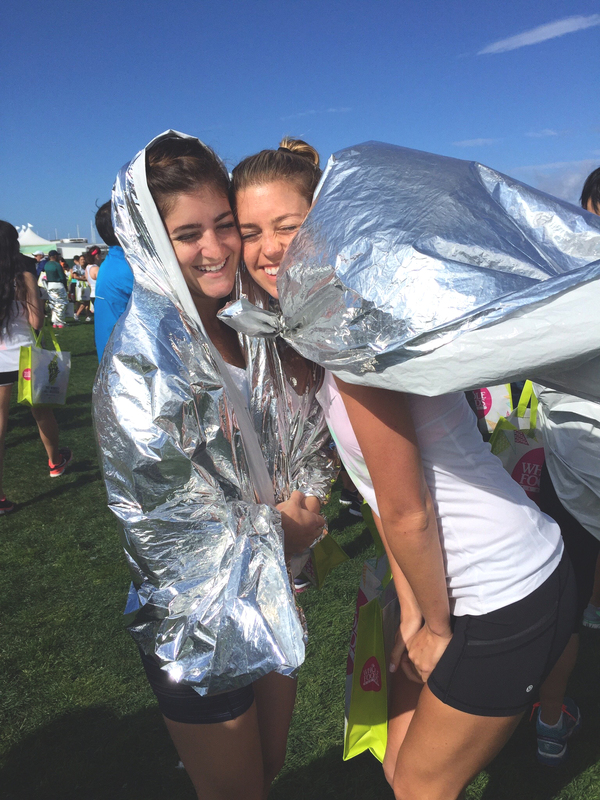 A combination of euphoria and complete physical agony/shock overtook our bodies as we crossed over the finish line. Thrilled with our results yet painfully aware of our stiffening muscles (it sort of felt like our feet had become cement), we grabbed our Whole Foods finisher bags (banana and chocolate milk… ideal) and silver cape-blankets, received our Tiffany boxes (while crying and saying “oh my God it’s happening,” much to the amusement of volunteers), and limped to a patch of grass wearing said silver cape-blankets to sit in numbness for a few minutes. I got ice from the medical tent to ice my shins and ankles, all while eating a banana and drinking a chocolate milk. I used the Nike+ Running app the whole time, and when I finished my workout, I realized that in a matter of two days, I had broken all my previous running records. 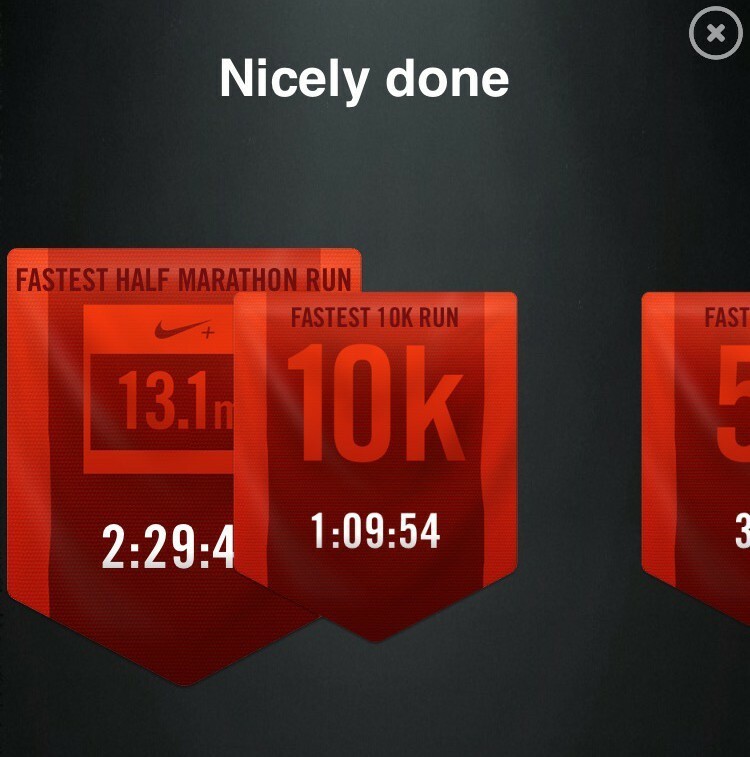 Fastest half marathon, fastest 10k, fastest 5k, fastest 1k, fastest mile. 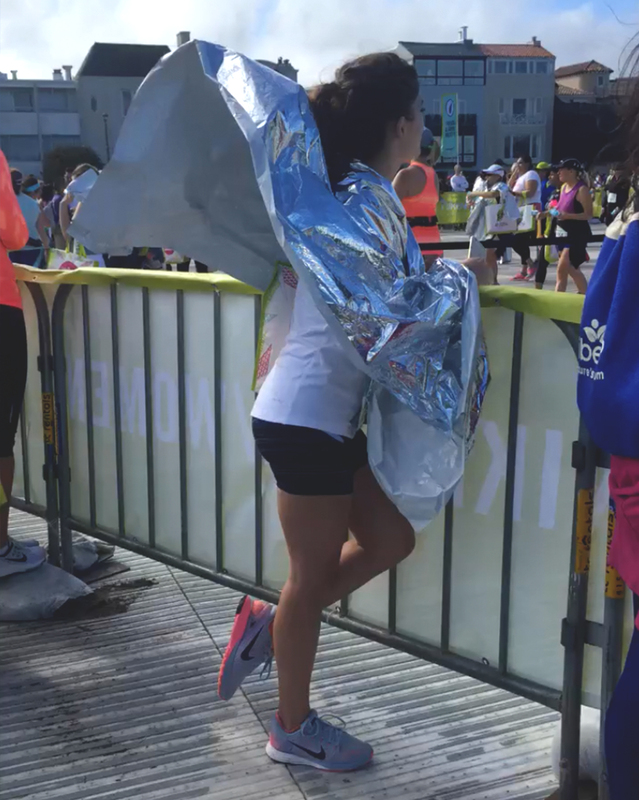 I was starting to feel like a real athlete – then I remembered that the winners finished over an hour before I did. 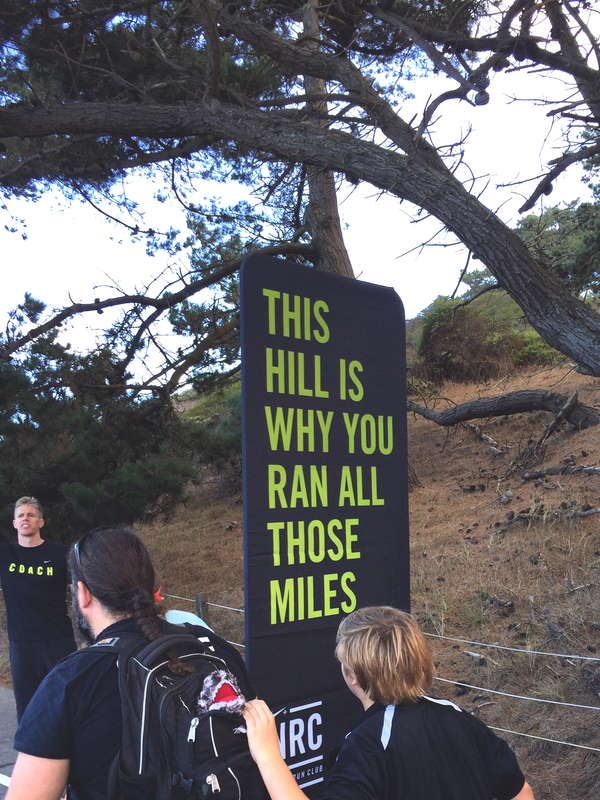 But still… “records” were actually on my radar, and I was trying to beat them. Before I started running, I thought PR only stood for Public Relations. I had zero clue what it meant in the context of sports. 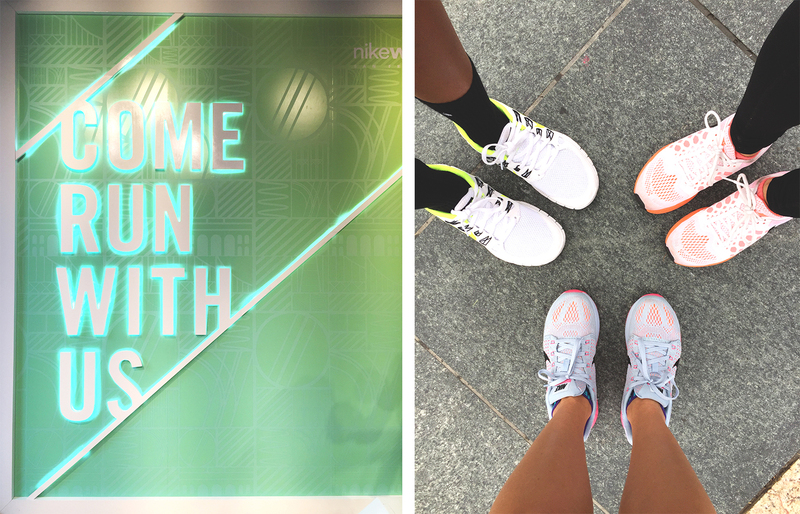 It was another amazing weekend for the books, and another great event by Nike. Feeling so grateful to have experienced it with good friends AND my mom, who btw, totally crushed her time walking the whole thing (mad respect, I would be bored af). We hit up the Tipsy Pig afterward for the burger (it’s becoming a tradition) and a drink, before passing out at home and going into a miniature coma. But to sum it up, I totally felt like a superhero this year. 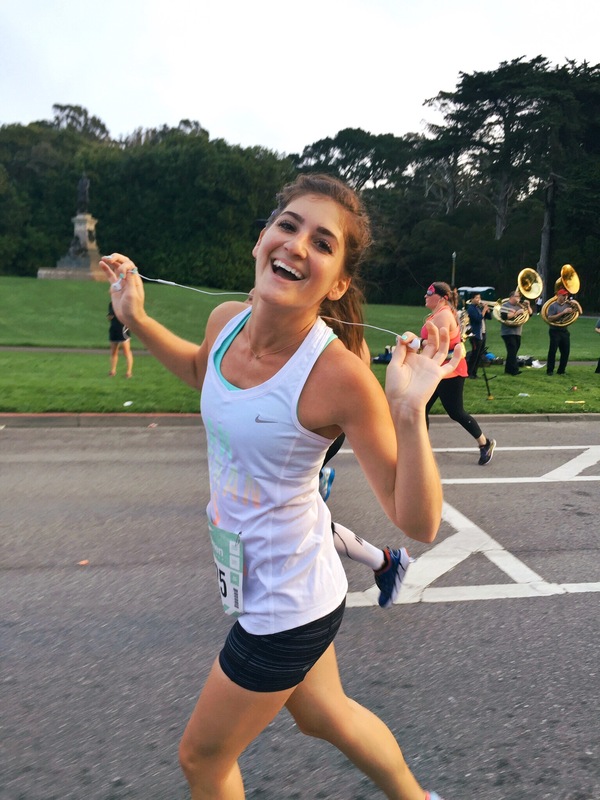 You make running look like so much fun! haha. Great job! 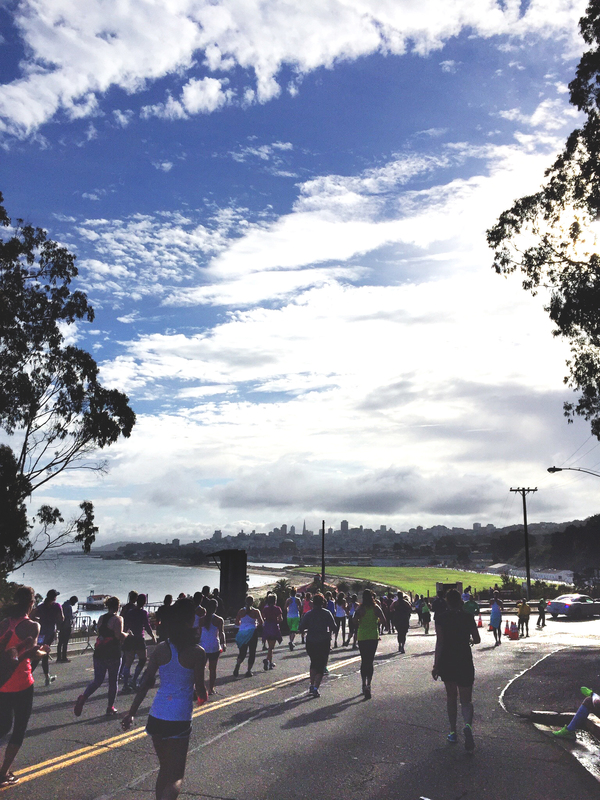 It’s on my bucket list o do a half marathon and this one looks so much fun! Sanfran is so beautiful!